The icy entity of mountains is a dream of the individuals on the ‘white’ trip. Glaciers despite their coldness have a tendency to attract adventurers with the warmth of challenges. These lay on the roads unmindful of those people on glacier trekking. Indian Himalayas provide an inimitable opportunity to get to know this facet of the Nature. What is in store for the trekkers on the ice-glazed treks to the insurmountable snow-donned glaciers? Answer is just about everything that Nature on the mountain has to exhibit. India glacier tours have abundant views of formidable valleys, serene mountain lakes, thick forests covered in snow here and there, wanton rivers, cascading and frozen water streams as well as waterfalls, meadows with prismatic colours and invitingly shining glaciers finally as the sceneries changes its colours from the beginning to the end. Even when it is not actually trekking ‘on’ the glacier but ‘to’ it till ‘Zero Point’, Glaciers trekking in India gives variety of experiences. Zero Point is understood as a vantage point for glacier sighting which is around 500 m away from the actual glaciers, going beyond which is prohibited due to looming danger of glacier-sliding. As far as ‘variety of experience’ is considered, take the instance of Pindari and Namik. 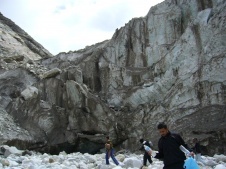 Pindari Glacier could be trekked to even with family having kids; on the other hand Himalayas have, Namik Glacier that would require strength in determination to actually accomplish the trip. Some of the most popular glaciers in India include names like Milam, Pindari, Bhadal, Bhaga, Zemu, Siachen, etc hidden in Garhwal and Kumaon of Uttarakhand, Leh Ladakh of Jammu & Kashmir (J&K) and in other states like Sikkim and Himachal Pradesh. Know the right trekking gears that will be the only true friend on such altitude and climate, and seek clearance and inner line permit from forest departments wherever necessary. You will thus become glacier-trekking-ready. Are you geared up to be one of those determined obstinate trekkers on path to accept challenges of Nature?